Unlike the prior piece, this time I switched to my more drawing style. It’s a different sort of challenge and produces different results. It’s less painterly and photo-realistic, but more obviously done by hand, and shows more interpretation. What the neural network produces is useless as art, and looks horrible blown up, but is intriguing fodder for a new kind of portraiture. I think my version looks significantly different if one spends a little time with it. I mentioned this before, but here it goes again — even though the photo on the left is the real me (which I never include in this series!) I now envision myself looking much more like the one on the right. The original looks too young to me. While working on it for a while, when I go in the bathroom, I’m surprised that I look younger. This is a curious bi-product of making repeated older images of myself. This is a pretty standard rendering approach in which one blocks in the general shape and color, moving from the general to the particular. When people just copy mechanically, like Chuck Close and myriad photo-realists, they tend to work in one little section at a time, and not on the whole at once. Yes, when working digitally, you can flip the canvas instantaneously, which really helps to see your work freshly. People who use traditional mediums will do this by holding their paintings and drawings up to a mirror. I’m not a traditional or academic portrait artist, and my preferred M.O. is to work entirely from my imagination without premeditation, but my portrait skills are improving. The left side will allow that kind of expression, because I have no idea what I’m going to do with it. It will happen in the process. I like that this series works on multiple levels. On one level it’s just portraits, or self-portraits of sorts. But then it incorporates AI, and represents an exploration of digital painting technique(s), some of which I invented. It explores age, gender, circumstance, identity, race (stay tuned), the relation of the self to the self, hyper-reality, alternate realities, and “the human condition”. It evolves and tells a story. None of the people depicted exist (in the closer versions they don’t exist as depicted). All of the people are based on recent photos of me. All of the images are a collaboration with AI to some extent. All of the images are digitally created (a new avenue of fine art). There are other dimensions I’m going to open up in coming pieces. But first will be the left side of this piece. Posted in art, Selfies From Alternate UniversesTagged art, contemporary art, digital art, digital painting, painting, portraitBookmark the permalink. I really like seeing the in-progress snapshots! I think you should share them in more of your posts. I’m guessing some people assume you’re working directly on the neural network version, modifying it, instead of starting from scratch. Sometimes I do work directly over it, though never without first modifying it, as I’ve never got a result that was ready to use. I wouldn’t start from scratch as a matter of course if I didn’t believe it would impact the result positively. It all depends on what I’m trying to achieve with the image in question. Sometimes I want to keep the photo-realist element there because something uncanny has happened that won’t survive re-interpretation. Other times I’m after a more traditional look. Some I add things (like the guy with the tumors and one blind eye), change them (I’ve had to change a lot of hair! ), or switch out the background (lots of them). Some are more impasto, some are more like oil paintings, some like drawings or pastel, and others like photos. So, I use multiple approaches and techniques. That’s how I work. I do lots of experiments, combine them, create hybrids, and integrate what I’ve learned. My “Alien Monster Messiah” pieces will benefit from this series, as I will be better able to infuse them with “humanity” and introspection, as well as render little details. And vice verse. I love this presentation of your latest work, the step-by-step, the details, and the insight you provide into digital painting. The blocking-in sequence in wonderful. The whole thing benefits me as an amateur portraitist using conventional media. I always enjoy reviewing the entire sequence. I say this haltingly, but in this latest the face you create has a presence, a weightiness, that isn’t in the original. It amuses me to say that it looks more like you than you do! 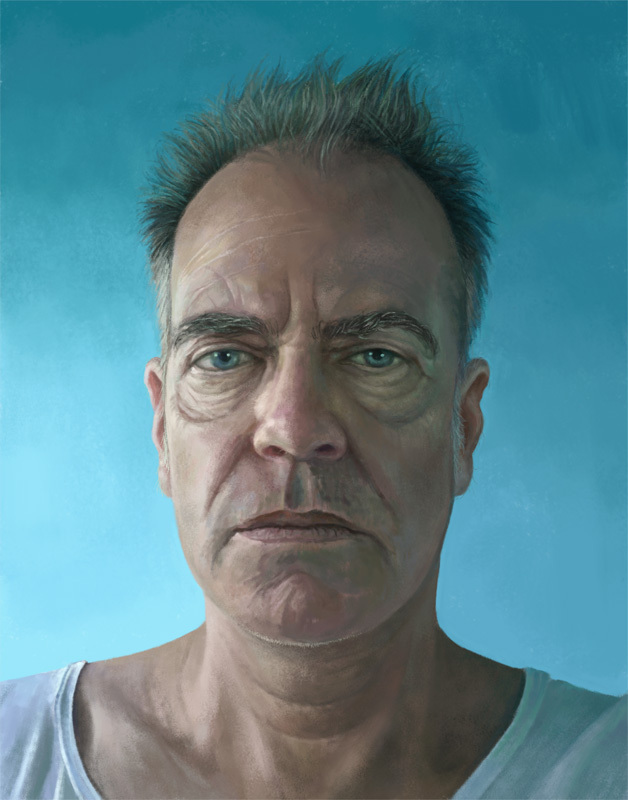 The cumulative tiny details and enhancements and distortions that you introduce into the “derived” self-portrait, the “older” you, seem to extract character from a certain blandness. I guess it’s generally agreed that older faces tend to be more interesting than youthful ones. You surely experience some intriguing introspective moments as you do this work. I like to hear that, and I agree. The original is innocuous, just a generic snap with a crappy phone camera. The AI gives is some potential, but doesn’t realize any of it. By interpreting it I add elements, consciously or not, that make it a “portrait” in art historical terms. It has much more character, and, you really nail it here: “. It amuses me to say that it looks more like you than you do! “. A lot of them do, even a couple of the female ones. They don’t look more like me than me in the flesh, but more than a blasse photo of me. And some of the ones that look most like me physically don’t say much about me, or about introspection. Well, that’s not really fair to me. They do, but not as much as the ones where I managed to infuse much more of the interior into the exterior. I thought of you when I read about Horacio Cardo, the illustrator. He talked about using Photoshop on pictures to get at a deeper reality. Your process is even more complex. Your tools are unfamiliar to me, but you use them to great effect. I must say, I think you may be unique in art history in depicting female versions of yourself!